Offered for sale with NO ONWARD CHAIN and having been updated over the past 3 years is this 2 double bedroom semi detached bungalow that is situated on a bus route and that has level access. This uPVC double glazed (all recently installed except living room window) and gas centrally heated (installed by current owner) property comprises of a living / dining room with an electric fireplace feature, modern fitted kitchen with a built in oven, hob and hood, 2 double bedrooms, one with modern storage cupboards and a bathroom with a fitted white suite. There is a long driveway providing off road parking for several motor vehicles and a single garage. 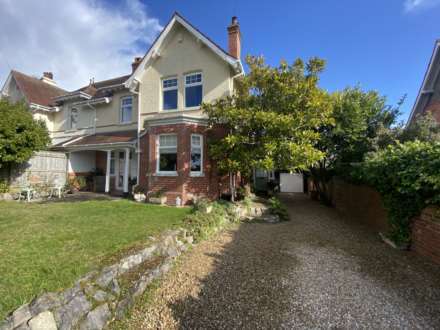 Further benefits to the property include a front garden that is laid to lawn and a good size rear garden that is laid to shingle and that has ease of maintenance in mind. Handy for local amenities, an early appointment to view is advised. Window to side and a part obscure glazed door to rear leading out to the rear garden. A modern fitted kitchen that has been updated within the last 3 years and comprises of a range of "soft close" floor standing and wall mounted cupboard and drawer storage units with roll edged work surfaces and complimentary tiled splash backs above. Inset stainless steel one and a half bowl sink with a single drainer unit and a mixer tap above. Built in 4 ring, stainless steel, gas hob with a filter hood above and a built in, eye level, electric oven. opposite. Space and plumbing for a washing machine and a slim line dishwasher. Vinyl flooring. Concealed high level electric trip switch fuse and meter box. uPVC double glazed window to front. Radiator. Useful range of built in storage including 2 x wardrobes, drawers and a dressing table. L shaped room. uPVC double glazed window to front. Radiator. Obscure uPVC double glazed window to side. White suite comprising panelled bath with mixer tap and shower attachment above. Low level WC. Pedestal wash hand basin. Tiled splash backs. Vinyl flooring. Heated towel rail. Up and over door to front. Window to rear. Outside security lighting. There is a good size Rear Garden that has been planned with ease of maintenance in mind and that faces in a southerly direction and enjoys the lions share of the sunshine during the finer weather. The garden is laid to shingle with 2 x shallow steps leading up to the main area of garden. Plumb and apple tree to the top end of the garden. Timber fenced boundaries. Front pedestrian access to the side of the property via a timber garden gate. From our prominent Town Centre office, proceed into Exeter Road and take a right hand turning into Hulham Road signposted Ottery St Mary. Proceed over the roundabout and take the next turning right into Marley Road. Take the 3rd turning on the right into Spiders Lane and right again into Partridge Road. The property will be found on the right hand side on the corner of Grenville Road.